I’m a Real Runner Now! (I think). 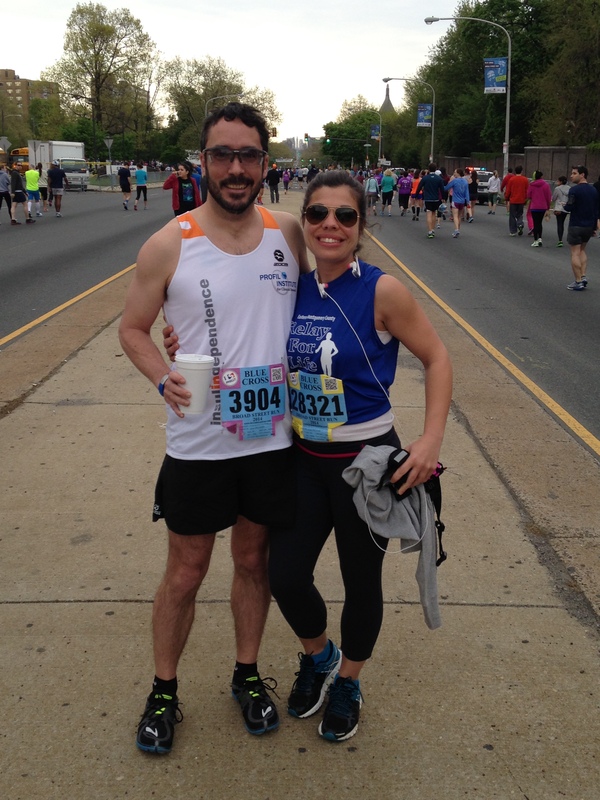 This past Sunday, I ran the Broad Street Run for the 3rd time. Even though it’s one of the most crowded races I run (40,000 runners! ), it’s still my favorite. I love running through the city of Philadelphia, seeing the street lined with cheering folks, from all walks of life, playing music, shouting out support, smiling, and waving. Plus it’s pretty freakin’ amazing to run through the very same city that I’m usually driving through, stuck in some kind of traffic, not looking at anything but the bumper inches in front of mine. The Broad Street Run provides an entirely new perspective. It gives new life to the city I’ve spent so much time with my head down in. Every building, every cross-street, every person becomes a wonderful site worth savoring as I wind my way with the crowd from the North end of the city to the South. The neighborhoods that are so vastly different, are joined seamlessly into one, but the endless stream of runners, and spectators. It’s kind of a spiritual experience, I suppose. 1. I dressed properly. In the past, I’ve worn clothes that I could run in, but I always had some weird thing going on – a shirt that made me too warm so I had to hold it, keys that I didn’t know what to do with, shorts that rubbed me the wrong way, etc. But this year, I finally had the outfit down. I had the right pouch to hold my keys, the right armband to hold my phone, and the right clothes to avoid being too hot, too cold or too chafed. dressed for success with my partner in crime. 2. I wanted people to get out of my way. For the first time in any race I’ve ever run, I found myself getting annoyed when I came up behind someone who was slower than me. In the past, I felt relieved when this occurred, and slowed down to their pace, giving myself a break. Not this time. The last three miles in particular, I was determined to keep the pace I was running, and found myself dodging folks left and right, doing Indiana Jones-like sideways jumps between two runners with little space between them, hopping up onto the sidewalk, and muttering “c’mon!” under my breath. I’m becoming a monster. 3. I beat my previous time (by A LOT). My fiance always said that I could run faster, and as much as I hate to admit it, he was right. Not only did I crush my previous time, I felt FINE. I was in no pain that day, no pain the next day, and I could even run again. In the past, it took a good few days before I even considered running again after running a race longer than a 10k. But not this time. I could have run again that same day. But I’m not that insane (yet). What does all this mean? Well for starters, all that running over the past 4 years has really paid off. And all that thinking that I couldn’t run any faster – that was a load of mental crap. Anything really is possible, once you decide that it is. I just hope this doesn’t mean it’s time to sign up for a full marathon. Yikes. ← Gotta be the Shoes.